Trieste III in the background after a dive. 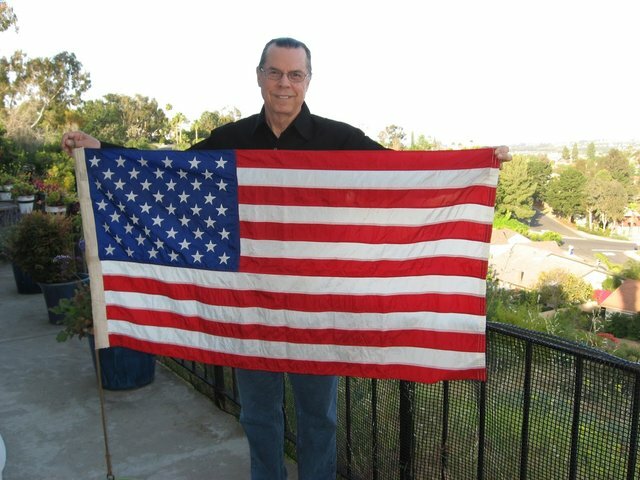 I spent most of 1969 at sea. As the Executive Officer and Navigator for the USS Apache, I was responsible for determining and reporting the position of our three-ship unit directly to the Chief of Naval Operations in Washington each day during Phase II of the Scorpion Search Operation. Until I reported to the Apache in the summer of 1968, the only experience that I ever had with navigation was at Officer Candidate School back in 1965. Also, I watched Alan Villiers shooting the stars when I was working on his square-rigged sailing ship during a Pacific crossing. My total practical experience consisted of a few weeks of course work at Officer Candidate School, which included one day out on the river playing with sextants. In other words, I didn't know squat about navigation when I first arrived on the Apache. So I quickly began to study, and when we were just off the coast of California doing test dives, I always made a point of shooting the noon sun line, as well as morning and evening stars. Along the coast there was Loran C and visual aids, but the Loran was less than useless, and so I knew that my trusty sextant would be the only hope of getting the job done. Over time I became quite proficient in getting good star fixes. In fact, I believe that of all the jobs I've had and things that I've done, the one thing that I actually excelled at was being a celestial navigator . . . all modesty aside, of course. Early in 1969, the Apache took the USS Whitesands in tow, and in this great, cavernous floating dry dock that during World War II floated destroyers up and out of the ocean for repairs, in this historic old vessel was the bathyscaphe, the USS Trieste III. At the time, the Trieste was the only human-piloted deep submersible in the world that was capable of reaching depths of over 11,000 feet, where the USS Scorpion lay in the middle of the Atlantic. We towed the Whitesands/Trieste to and through the Panama Canal. Then we sailed onward to Mayport, Florida for repairs and final fitting out of the Trieste for our attempt to find the site of the Scorpion. On a lark, a few of us officers flew our wives to Mayport, where we had a five day vacation with them. Mary and I had a great time, even made it to St. Augustine. I can easily find the date of that vacation, because during that time the television in the motel was in constant coverage of the funeral of President Eisenhower. From Mayport we sailed to the Azores Islands, where, on the morning of our arrival, I got one of the best star fixes that I'd ever made. When we sighted land I had to make visual corrections to what I thought was a perfect fix, because I discovered that our track was 1/2 mile off. A few days later, the Navy's only operational satellite navigation system was installed on the White Sands, because we needed to be within a few feet of the suspected location of the sunken submarine to have a chance of actually finding her. 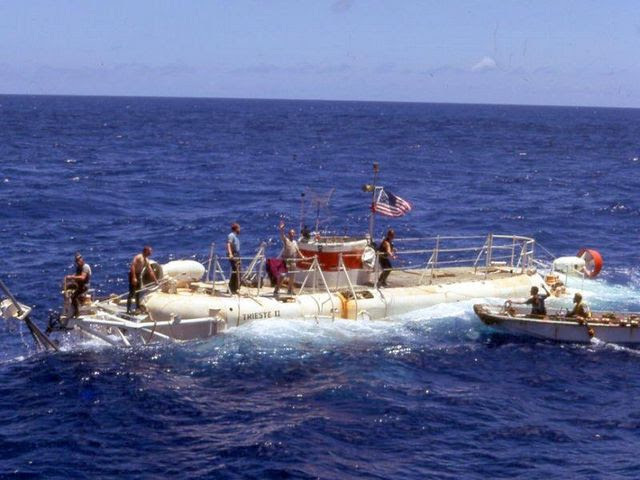 That Sat-Nav system, by the way, was flown to us from Viet Nam, where it was being used by the USS New Jersey, who had to do without it while we were on station with it on the Scorpion search operation. When the technicians finally got the Sat-Nav operational, it was discovered that the entire island had been mis-plotted on the charts by 1/2 mile. That was when my captain, Larry Lonnin, who had once been an enlisted quartermaster, began telling his friends that I was the best navigator he'd ever known. Lonnin always called me "Number 1," in the tradition of the old British Navy where the first officer under the caption was, obviously, number one. Even with the advantage of a Sat-Nav system, and the fact that a few months earlier the USNS Mizar had sonar-located the Scorpion and dropped homing beacons near that location, there was still much room for error in finding the sunken submarine. It took the Trieste three dives before making the first visual contact with the sunken ship. On each of the dives, there were nine in all, the Trieste flew a new U.S. flag. The one that she was flying on dive three is the one that was given to me. After treasuring it for many years, I donated it to the Scorpion memorial museum on the East Coast. Hopefully, family members of the lost crew find a little solace in being so close to a flag that was once at the tomb of their loved ones. June 5, 2018 will mark the 50th anniversary of the Scorpion's loss. There are many stories that I can tell and have told about this long voyage, but that's enough for here. I've spoken with several authors who have published books about our operation, and I have little cameos in many of them. So those stories are still out there somewhere. But for me, this trip was one of the greatest physical achievements of my life. Our round trip covered over 14,000 nautical miles, and somewhere in one of my boxes I have a letter from the Commander-in-Chief Pacific congratulating me for being the navigator of "the longest continuous ocean tow in U.S. Navy History." I know, it is only a minor footnote in a huge history. But hey, how many of us ever get to even be mentioned in history? It may be only a footnote, but it's my footnote. When I left the Apache, Captain Lonnin, at some personal risk, "surveyed", as in claimed it was no longer serviceable, the sextant that I used to navigate the entire voyage; as we never had any reliable Loran coverage after we were about 100 miles south of San Diego. I still have that sextant. It's sitting here next to my desk, and it is one of my most treasured possessions. That is amazing @LorenzoHagerty! Thank you for sharing your story, and what a timing! I was just looking for a sextant on amazon.com trying to figure which one to get (i still don't know)... I would like to learn celestial navigation; My father and I love astronomy and I can easily point at constellations and stars. And just the other say I was sailing at nighttime and looking at all the stars, spotting Polaris, and thinking that I really need to learn celestial navigation. 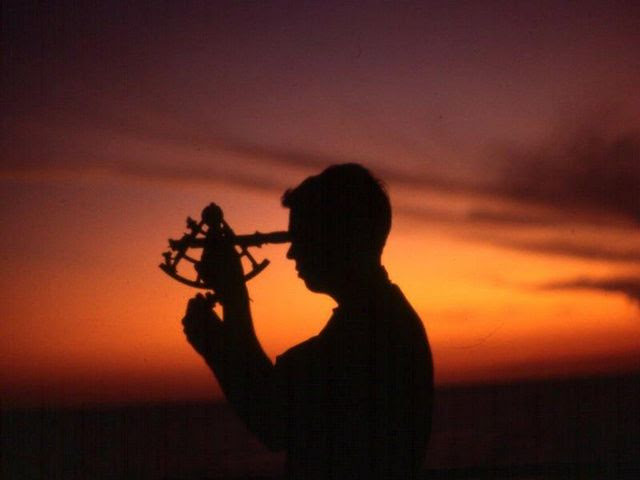 May I ask, what sextant would you recommend for a newbie (but a serious newbie :D) ? and also would you ever consider teaching other sailors and sharing this incredible skill of yours?